So what makes a great remix? Everyone will have a different answer. Fans of 90s electronica—those who love long, “oonts-oonts-oonts” mixes with most of the vocals removed—will answer that question differently than those who value more subtle reworkings that manage to add some spice but still respect the original song. Asking “What is the best U2 remix?” will elicit as many varied and spirited responses as asking “What is the best U2 song?” or “What is the best U2 album?” Opinions are strong and varied. Your list will look different than mine. Heck, my list will look different than mine depending on the day! Wait—the first song on the list is a remixed b-side? Absolutely! “Lady with the Spinning Head (UV1)” is not just an ordinary b-side, though, it’s a much-beloved outtake from the Achtung Baby sessions that contains unmistakable traces of album tracks “The Fly,” “Ultraviolet,” and “Zoo Station.” The standard b-side, which is astonishingly awesome in its own right, made its debut on the flip-side of the “One” single in 1992. 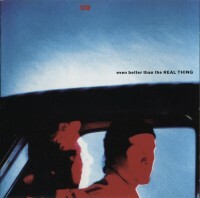 Alan Moulder’s formidable extended version then appeared on the following single, “Even Better than the Real Thing.” I love the drums and bass that kick off this remix—although this is clearly a dance version, the rhythm section sounds very much like Larry and Adam, not a drum machine. There are all kinds of crazy sounds on this, including guitars that pan back-and-forth between the left and right channels. Plus there’s a little chill-out breakdown in the middle. It all adds up to something epic. Now here’s a remix with a long shelf life! Many people remember “Lemon (The Perfecto Mix)” as the intermission music on the PopMart Tour in 1997, or as the lead track on the very first fan club CD, Melon, in 1995. But it appropriately dates back to the Zooropa era, where it first appeared on various formats of the “Stay” and “Lemon” singles. Fans of British dance music and anything associated with Ibiza or Madchester in the early 1990s will be well acquainted with Paul Oakenfold and Steve Osborne. Their distinctive Perfecto mixes transformed several U2 tracks, as well as songs by New Order, INXS, Massive Attack, Madonna, and many others. And of course, Oakenfold himself served as house DJ on the Zoo TV Tour for a time. Despite emerging during a period when “celebrity DJs” would often deconstruct original songs to the point of unrecognizability, Oakenfold and Osborne had a welcome knack for dramatic reinterpretations that somehow maintained the integrity of the original. This mix of “Lemon” is a prime example. It carries on for 9 minutes with a hypnotic beat and a variety of synth sounds, and yet The Edge’s guitar remains a formidable presence. 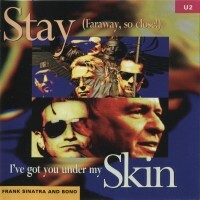 Even more significantly, the yearning of Bono’s lyrics shines through all of the digital sheen. I can’t think of another song written about someone’s deceased mother that has this much booty-shaking charm. This is the earliest remix on the list, and it’s interesting to consider how much technology has evolved when comparing it with, say, “Magnificent (RAC Mix).” The beauty of this mix comes from the way Kevorkian manages to take just basic elements—guitar, bass, drums, and especially piano—and transform them into something new. 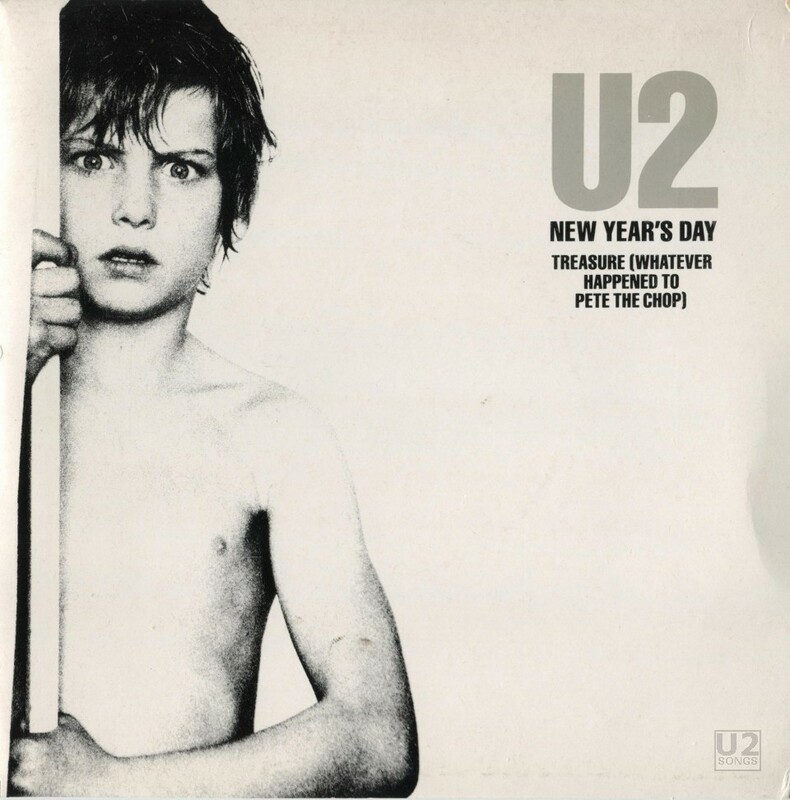 It doesn’t hurt that this mix features alternate vocals not heard on the album version of “New Year’s Day”—and not just different vocals, but different lyrics, as well. After a haunting, reverb-laden solo piano playing the familiar NYD riff, we hear Bono sing, “You won’t hold me down; You won’t break this up; I… I WILL BE FREE AGAAAIIIIIINNNN!” It sends chills up the spine. 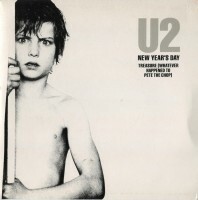 While this version has lyrics that are largely different from the iconic version of “New Year’s Day” that we know and love, it nonetheless encapsulates the passion, the optimism, the social consciousness, and everything else that made U2 special in 1983. 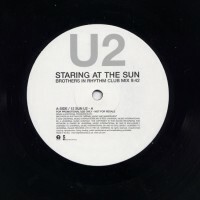 While “Staring at the Sun” made its debut on the 1997 Pop album, this remix did not appear until 2002 around the release of The Best of 1990-2000. This mix (along with the “Brothers in Rhythm Club Mix”) were only available on an obscure promo vinyl. However, the ambient mix (definitely the better of the two) was later included on the fan club remix album Artificial Horizon. 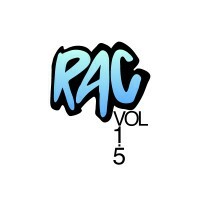 Like “Magnificent (RAC Mix),” I appreciate the technical aspect of this mix. Rather than incorporating elements of the studio version of “Staring at the Sun,” it uses a live acoustic recording from the PopMart Tour as its base (you can hear the enthusiastic audience in places, and surprisingly, this does not detract from the song). The live performance is likely the same version released on the PopHeart Live EP in 1997. On top of this, Brothers in Rhythm add atmospheric keyboard sounds and effects (and significantly, NO beats whatsoever) to create a chilled-out vibe. 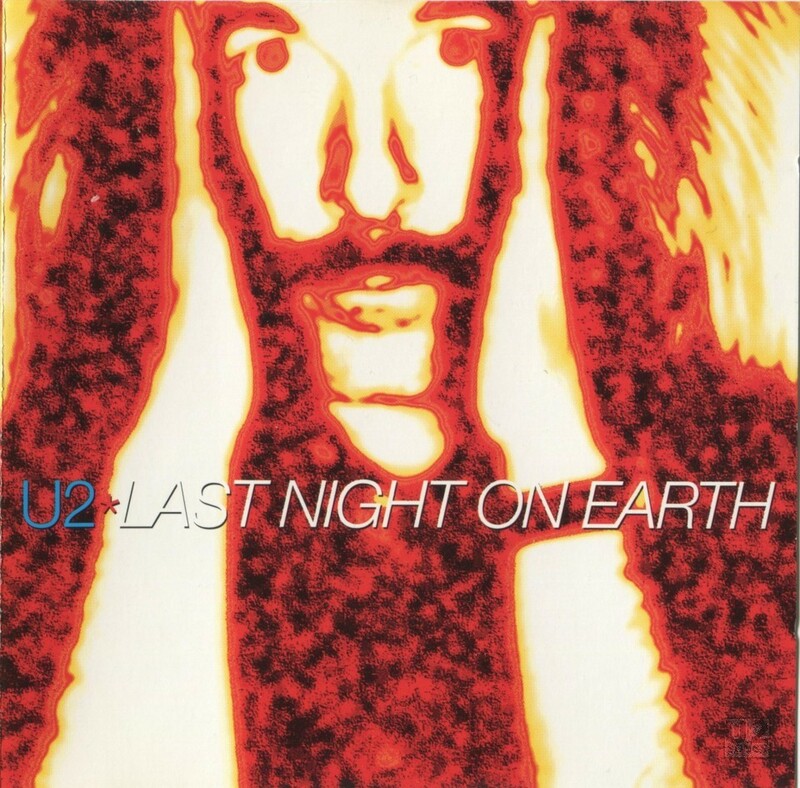 It slowly builds to an uplifting crescendo, definitely one of my favorite U2 remix moments. This mix is definitely a product of its time, but it is irresistible. It’s interesting to note that after eschewing “dance mixes” for most of The Unforgettable Fire and Joshua Tree eras, U2 began pursuing them again in earnest with Rattle and Hum—the album that was supposedly all about roots and Americana! But when you listen to this mix and other remixes from the era, not to mention the album version of “God Part II,” the journey from Rattle and Hum to Achtung Baby doesn’t seem quite as far as you might have thought. Anyway, this mix is filled to the brim with repetitive broadcast news samples related to gun violence, police brutality, and so on. This was a popular approach in those days, owing in no small part to Brian Eno and David Byrne’s 1981 album My Life in the Bush of Ghosts, which is often cited as a progenitor of hip hop as well as sampling . Where this mix is concerned, I love how Larry’s drums are looped over and over (and over and over and over), and also Edge’s percussive rhythm guitar stabs, which are not present on the album mix. Like Kevorkian did with “New Year’s Day,” Louil Silas and Taavi Mote take the basic elements of the song, strip them down, and then build them back up. 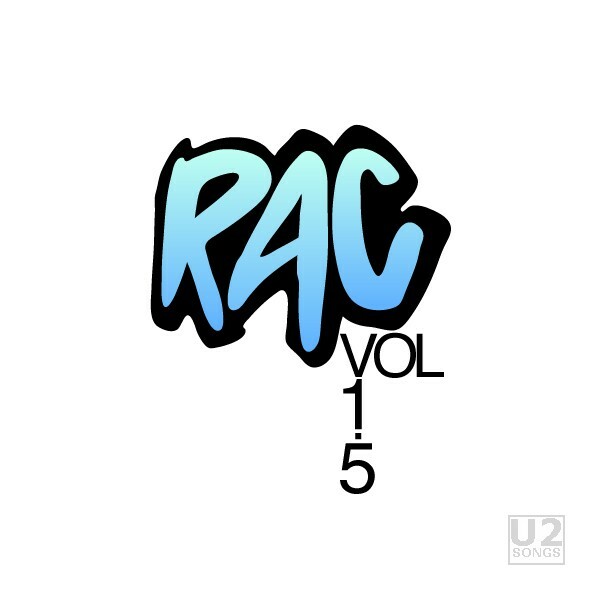 The most common version of this mix, from the commercial single, runs more than five minutes, but there’s a UK promo vinyl (oops, there’s my U2Songs geekiness coming out again) that runs for more than nine minutes. It’s repetitive and hypnotic in the best possible way, and it also has a lot of soul. So there was a remix of the first Achtung Baby single “The Fly.” Then there were something like 850 remixes of “Mysterious Ways.” There were even remixes done for the third single “One,” although those were ultimately shelved and did not emerge until the Achtung Baby anniversary editions in 2011. 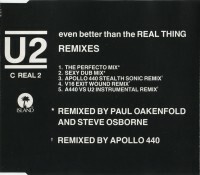 For the fourth single, U2 came out with all the remix flags flying once again, offering a wide swath of interpretations for “Even Better than the Real Thing.” In the UK, at least, the remix set charted higher than the standard single. The most well-known of these remixes was the “Perfecto Mix,” which even got its own unique promo video. It’s an iconic mix, but I think it pales in comparison to the jaw-dropping “Apollo 440 Stealth Sonic Remix” by Liverpool band Apollo 440. It’s aggressive and in-your-face while the Perfecto Mix goes for a more soulful and uplifting vibe. 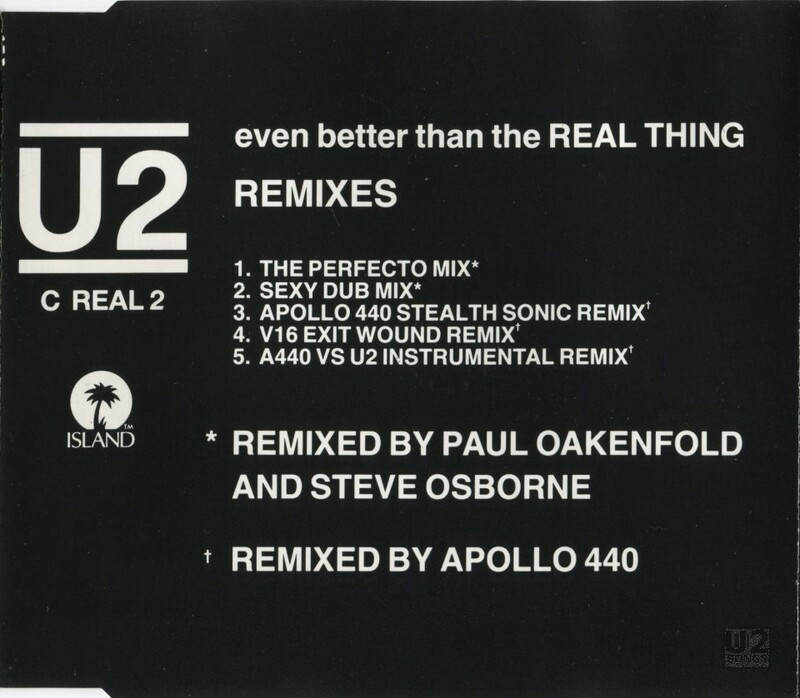 The Apollo 440 mix might be the closest a U2 remix has come to being “hard techno,” although you have to listen carefully because the sequencers are often buried beneath the guitar. Apollo 440 actually did three mixes of EBTTRT, including the “V16 Exit Wound Remix,” which is essentially a shorter, radio-friendly version of the Stealth Sonic Mix. While it has a cooler name, it comes on too hard and too fast, inducing whiplash. The Stealth Sonic Remix takes more time to build, making it the clear winner in this contest. Ok, I can sense that some of you are raising your eyebrows. 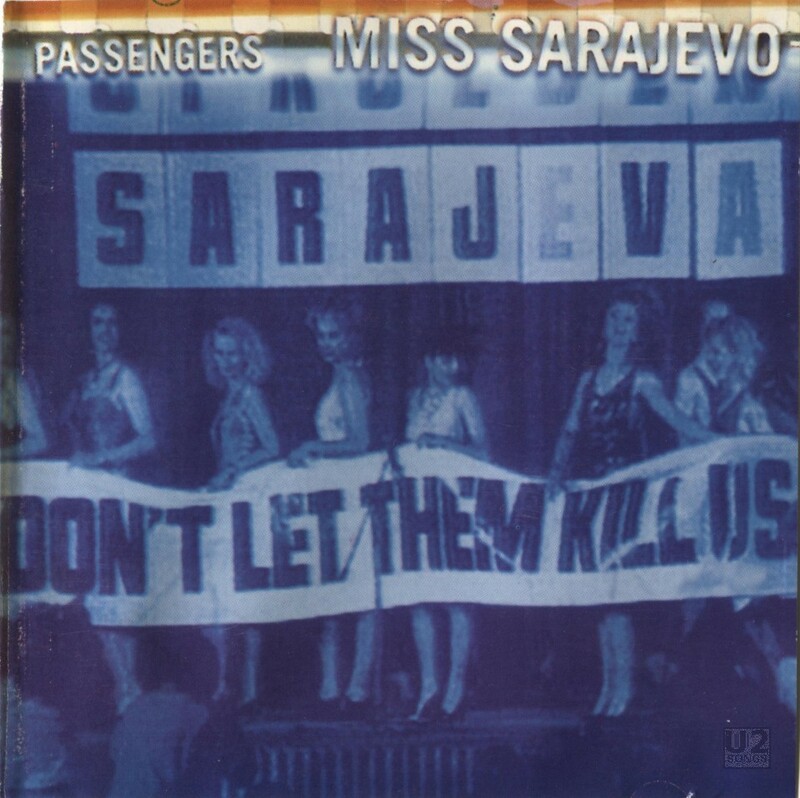 “Passengers isn’t really even a U2 album, it’s a side project!” Ok. There is also the issue of the confusing and baffling name of this track, which is so pretentious that it requires not one, but two sets of parentheses and is an astonishing 52 characters long. 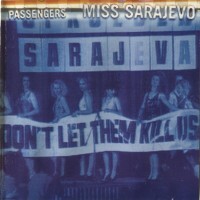 Let’s lay aside these concerns for now and just focus on the wonders of this deceptively simple instrumental remix of Achtung Baby’s opening track, tucked away as a b-side from the “Miss Sarajevo” single in 1995, four years after the album from which it originated. For starters, the way Brian Eno makes the drums build up around the 12-second mark is fantastic. It almost has a J-pop feel, which may be the reason for the quirky title. The “train station” vibe of the original track has somehow been enhanced here, and the descending electric guitar figure has also had some of the effects removed compared to the original, so that it almost sounds like an acoustic guitar. If you just put this on as background music you’ll probably think, “Meh—it’s just an instrumental ‘Zoo Station.’” But careful attention will reveal endless sonic details, and the track paints a cinematic picture that fits with both the Passengers concept in general and with Brian Eno’s methodology in particular. This upbeat side of Eno seems directly tied to his own Nerve Net album from 1992, which eschewed ambient textures in favor of danceable rhythms. I might not be able to pronounce the title of this fun remix, but it’s got a great beat and I can dance to it! If you were suspicious of the previous entry on this list, you’re probably suspicious of this one as well. 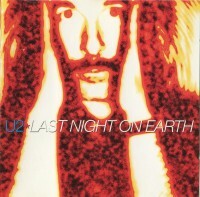 For one thing, it’s a cover version, not a U2 original. 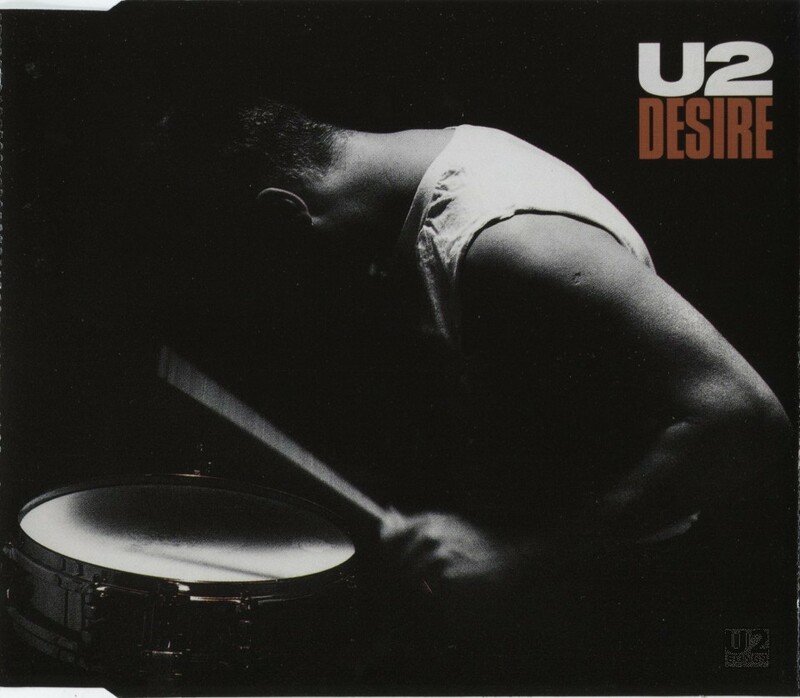 For another, it’s not exactly a “band” track… it’s got vocals from Bono and maybe some guitar from Edge, but most of the music you hear was created by Steve Osborne and Ben Hillier. Finally, while clearly a dance mix, there is really no “standard mix” to compare this to, just a shorter radio edit. No matter. This fantastic mind-trip manages to encapsulate the entire PopMart ethos in just under nine minutes. There’s a reason the band used it to take the stage during the tour. As the song unfolds you can almost feel the energy of the crowd increasing. Curiously, around the 5:30 mark, the beat drops out entirely, and you get a further three minutes of ambient sounds and keyboard effects. If you listen closely during this coda, you can clearly hear the opening sequencer and other sounds from “Mofo” playing underneath, further reinforcing the connection between “Pop Muzik,” which played over the PA, and “Mofo,” which was the opening performance as U2 took the stage, during the PopMart era. 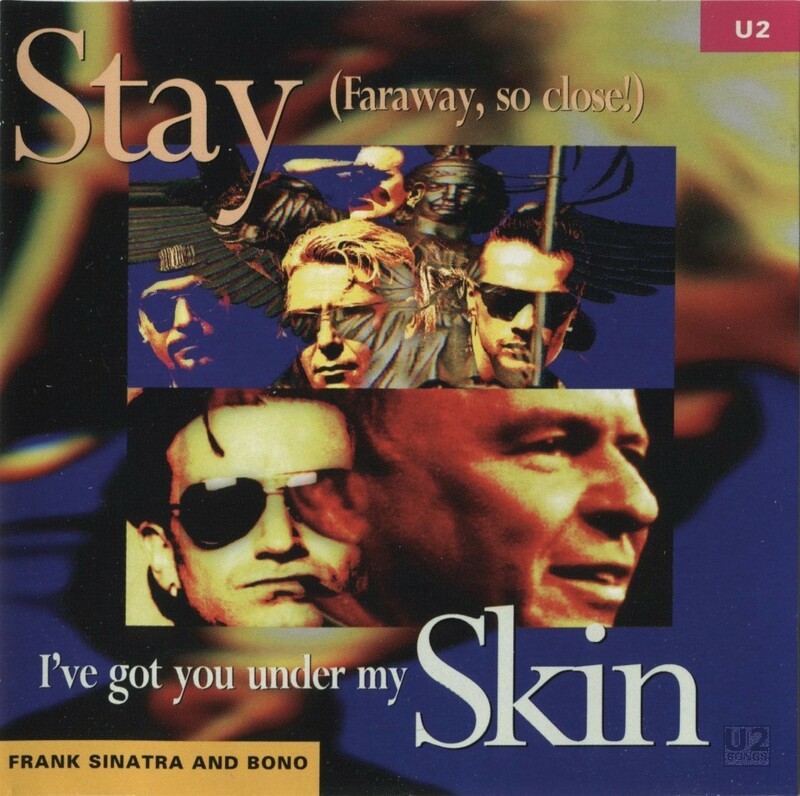 This probably isn’t the song to break out when you’re trying to convince your friends that U2 is the greatest band in the world, but it’s definitely a great dance track and another showcase of Steve Osborne’s considerable skills. The list ends as it began: with a remixed Achtung Baby b-side. Here we also encounter another familiar name to fans of British dance culture in the 1990s: the DJ duo of Farley and Heller, who also operated under the moniker of Fire Island. Like Oakenfold/Osborne and Apollo 440, Farley and Heller were responsible for a number of notable dance mixes of the time, spicing up tracks by New Order, The Farm, Happy Mondays, Pet Shop Boys, and more. As for the song “Salome,” if you’ve heard the infamous bootlegs of U2’s 1990 recording sessions at Hansa Ton Studios in Berlin, you know that it dominated much of the proceedings. 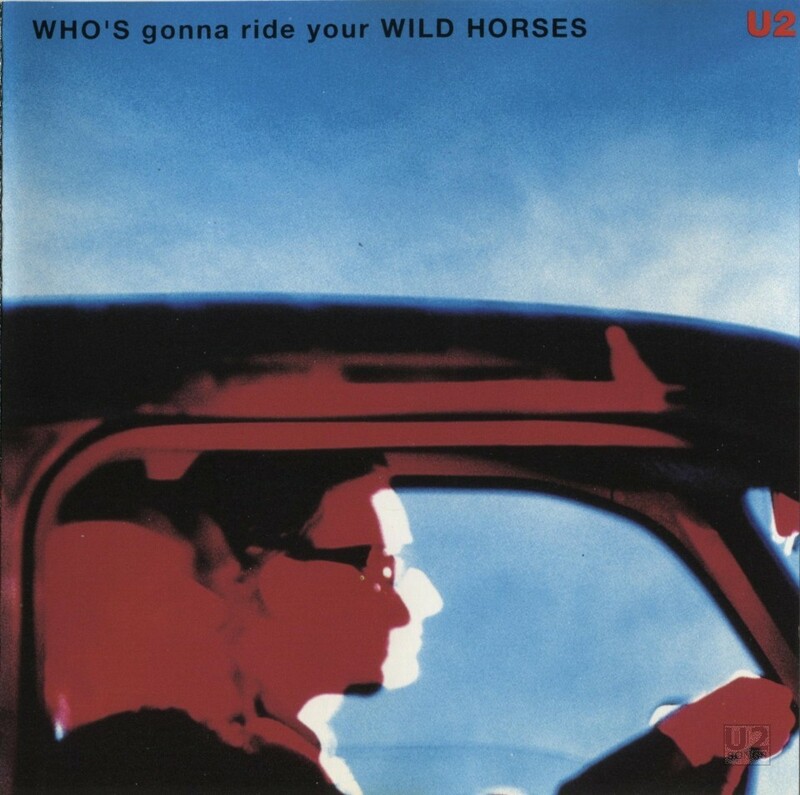 Even so, it was ultimately left off the album, with the Paul Barrett-produced standard version ending up as a b-side to “Even Better Than the Real Thing.” The original track was then handed over to Farley and Heller, and their extended dancefloor workout would appear across various formats of the final Achtung Baby single “Who’s Gonna Ride Your Wild Horses.” Where the standard b-side has a slinky, funky vibe, the Zooromancer Remix embraces a straightforward dance beat that illuminates the contrasts and contradictions of the Zoo TV era: neon grooves and beats married to dark, deeply spiritual lyrics.